The Sony Bluetooth Wireless Transmitter lets you enjoy your iPod music wirelessly on a compatible Bluetooth sound system. It doesn’t use a battery, and draws minimal power from the iPod. Basic functions can be controlled from a compatible Bluetooth headset with AVRCP compatibility. The compact size and simple operation make the Sony Bluetooth Wireless Transmitter a must-have accessory for true music lovers. 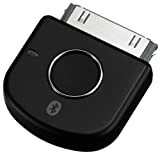 It is designed for any iPod with dock connector (30-pin). It couldn’t be simpler You just turn on your iPod and connect the transmitter to the port, and in order to activate it, you set your receiving device into pairing mode and then hold down the button on the transmitter for about 7 seconds until the two devices are paired. Let’s admit it: from day one that Apple introduced Leopard’s Time Machine, finding an adequate hard disk to fit the tedious task of backing up our data has been quite a problem. More problems for a multi-user home (more and more out there). Meet Apple Time Capsule , right from the same MacWorld Expo where MacBook Air was born! What’s inside Time Capsule ? - same sleek form factor of Apple TV. The hard disk is available to all connected Leopard users as the preferred Time Machine default storage device. Available for pre-order in 500 GB an 1 TB flavors, the Time Capsule retails US$299.99 and US$ 499.99 respectively. Belkin’s new N1 Vision Wireless Router wireless router features an advanced interactive network display that allows you to view the activity of your network. Belkin N1 Vision Wireless Router offers a built-in display for broadband network speed, upload & download speed, individual computer bandwidth usage, connected devices, total data usage over a 24 hour period, devices accessing the network as guests, and a general clock / date. Packaged in a new sleek and sophisticated design, Belkin N1 Vision Wireless Router offers the best in networking performance with its wireless 802.11n* 3×3 MIMO radio design and wired gigabit ports. The Belkin N1 Vision Wireless Router also continues Belkin’s commitment in providing the best user experience through its plug-and-play CD-less installation and simple network security setup. For more information visit belkin.com/n1vision/intro.